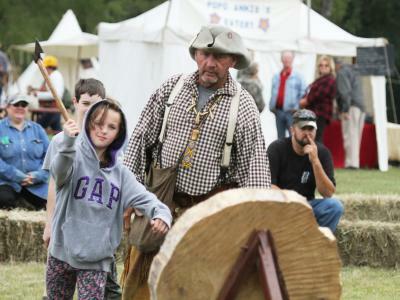 The sounds, sights and smells of an era long gone will happen at Kanopolis State Park Oct. 27-28, as the Prairie Long Rifles hold their 39th annual mountain man fall rendezvous. 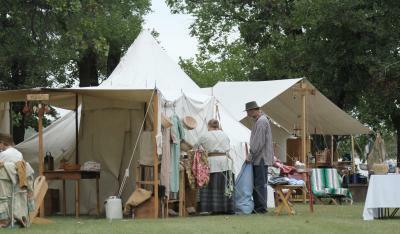 Barbara Long, a club member, said they’re expecting about 150 re-enactors, all dressed in clothing form the early-1800’s era, to arrive on Oct. 26. They’ll have an authentic-looking camp ready for the public to experience Saturday and part of Sunday. 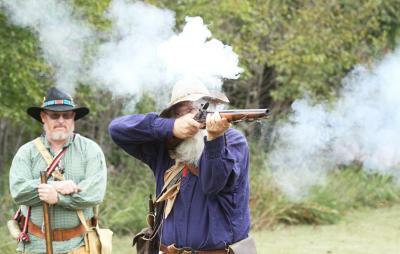 Experienced and beginning adult and youth shooters can fire authentic flintlock and percussion rifles. Equipment and instruction will be readily available. Club members can help guests learn to throw tomahawks and explain the gear a true mountain man needed to survive in the Rocky Mountain wilderness 150 years ago. Long said many of the members come with goods to trade, often that they’ve made themselves, like custom rifles and knives, leather goods, moccasins of deer or elk hide, beads and other trinkets. There will be games and prizes for kids. Guests are welcome to sit around a campfire visit with the experts. A dinner will be served Saturday evening, with a $3 charge for non-members of the club. Long asks people tell her or another member if they plan to partake of the meal. Sunday’s events include an authentic pole-shoot, where teams compete to see which can shoot muzzleloaders accurately enough to shoot a board in half. There will also be a Dutch oven cooking contest. Long stressed the setting and timing are ideal within the park’s Mulberry Campground.